THE team behind the new restaurant at the Gold Coast's most luxurious hotel Palazzo Versace have revealed what diners can expect when the "casual" fine dining venue opens next weekend. 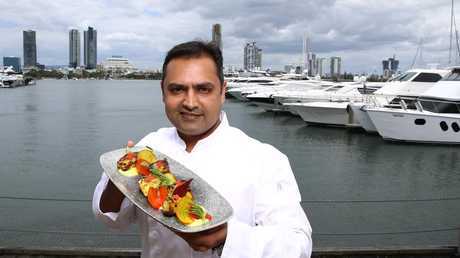 Michelin-starred chef Manjunath Mural and Saffron Broadbeach's Sridhar Penumechu will oversee the operations of Kokum, an Indian-Asian fusion restaurant promising flavours you won't taste anywhere else in Australia. On the ground will be head chef Sabir Merchant and venue manager Daniel Carne, cooking and serving food in the relaxed, yet sophisticated restaurant overlooking the water. 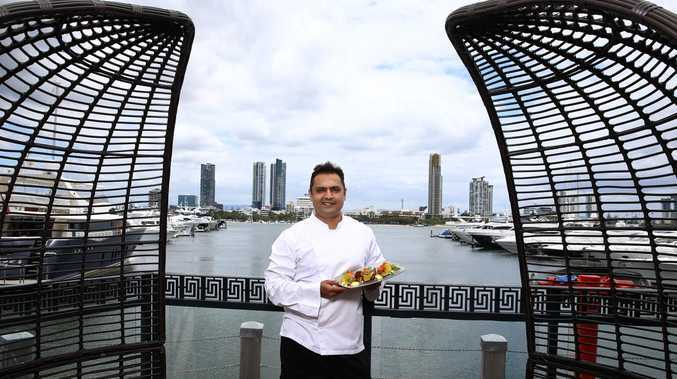 Mr Merchant said the hotel wanted to branch out from the modern Australian cuisine on offer at the previous Vie Restaurant and Bar, a style of food that has become widespread on the Gold Coast. "With (Palazzo Versace) being such a big brand, we have to be a little unique in what everybody is offering," he said. "Kokum is a very unique concept, and the cooking techniques and flavours will be something you cannot find in all of Australia." 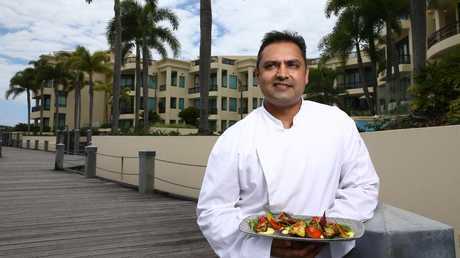 Mr Merchant says favourites on the menu will be the Tandoori-oven cooked sambal barramundi with caviar and eight-hour slow cooked lamb flambe featuring exotic spices from Kashmir, a northern region of India. "The whole menu is really amazing," Mr Merchant said. "We give each other a little bit of information about Australian cuisine, he gives me more information about his recipes and Asian and Indian ingredients. "Chef Manju (Mural) understands that very well, he's very good at mixing traditional and unconventional." Mr Carne says the dining area will be a "not too formal" space that will still exude professionalism. "It's going to be a very relaxing experience," he says. "A sunset feel, nice ambience, not too formal. Just a very pleasant experience for people. The way the venue's been put together, it's very pristine. "The food will be the hero." Kokum will open on November 16 from 11.30am seven days a week at 94 SeaWorld Drive, Main Beach.